When state Rep. Dawnna Dukes sent out an email to her staff last month, her urgent instructions about an upcoming project made clear what she wanted. But the email from the Austin Democrat had nothing to do with state business. An email from state Rep. Dawnna Dukes to members of her staff. The email provides instructions for work her staff must complete before the upcoming African American Community Heritage Festival. Editor's note: This story has been updated with comment from Women in Jazz Association founder Pamela Hart . When state Rep. Dawnna Dukes sent an email to her staff last month, her urgent instructions about an upcoming project made clear what she wanted. But the email from the Austin Democrat had nothing to do with state business. Instead, it was about a community event her office has sponsored and organized for years — the African American Community Heritage Festival. The Tribune reported last week that the state auditor's office is investigating Dukes' use of her legislative staff to work on the Heritage Festival. Dukes acknowledges that her staff worked on the festival, but she said in an interview Tuesday that the work was not as time-consuming as the email made it sound. "It tells them, all hands on deck. Which just means, make it a priority," said Dukes, who has held her Texas House seat since 1995. Legislative ethics expert Buck Wood said lawmakers can support pet causes. But legislative staff, whose salaries are paid with taxpayer funds, cannot be directed to work on such causes. "It's just not something you do with your office," Wood said. "You can't do that." In the email, Dukes doled out specific duties to her staff — then-Chief of Staff Mike French, former Legislative Aide Vanisha Weatherspoon and current staffer Brenda Estrada – for the Feb. 27 festival. "Mike, it is imperative that the entire office is hands on the Festival. I want every one to be focused on this daily," Dukes wrote. "Brenda and Vanisha look at the plan. BE and VW start identifying what needs to be done. BRENDA, I'd like you to call sponsors to lock down contribution receipt. Mike provide Brenda an updated Excel spreadsheet (not a word document) in the format used in previous years on status of every sponsor." 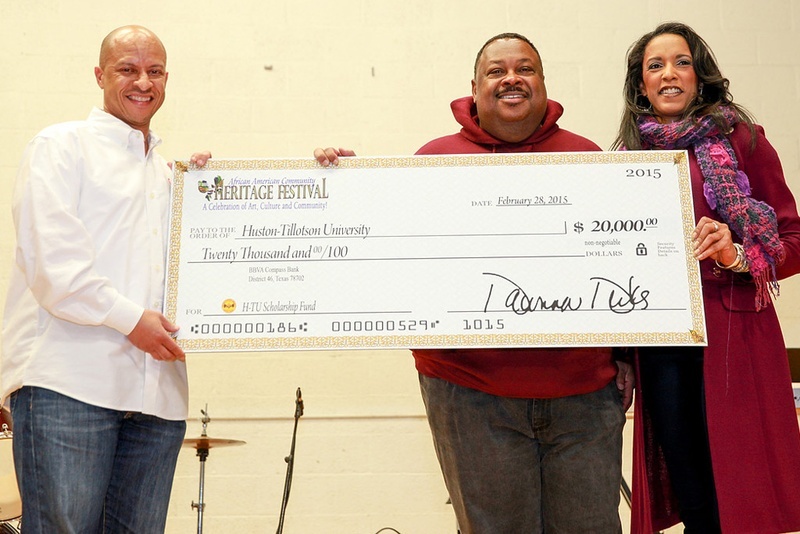 State Rep. Dawnna Dukes presents a $20,000 check bearing her signature to Huston-Tillotson University during the 2015 African American Community Heritage Festival. Dukes said her staff's work was neither illegal nor improper. "They didn’t have to do anything more than to make roughly 20 phone calls, and they had plenty of time to do it," Dukes said of the staffers. "I mean literally 20 phone calls out of 152 hours in a year. Twenty phone calls could take you less than two hours maximum if you’re talking 30 minutes to every person. It just meant, make it a priority." Pam Parker, a former Dukes staffer and the festival organizer since 2011, said the legislative staff did limited work on the event. Three former staffers told the Tribune that their festival duties — which they said consumed much of their workdays in the weeks leading up to the event — included contacting sponsors, assisting with setup the day of the festival and coordinating with the nonprofits involved. Dukes' Jan. 12 email indicates that there are special files for the Heritage Festival kept on state staffers' computers. 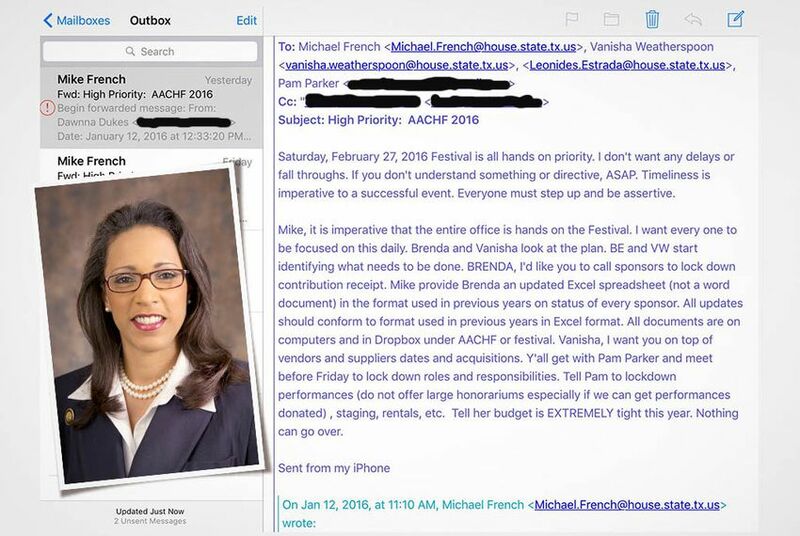 "All documents are on computers and in dropbox under AACHF or festival," Dukes' email states. "Vanisha, I want you on top of vendors and suppliers dates and acquisitions. Y'all get with Pam Parker and meet before Friday to lock down roles and responsibilities. Tell Pam to lockdown performances (do not offer large honorariums especially if we can get performances donated), staging, rentals, etc. Tell her budget is EXTREMELY tight this year. Nothing can go over." Dukes helped create the African American Community Heritage Festival, which has raised money for Huston-Tillotson University scholarships for the past 17 years: about $170,000 over that time, Parker said. In a Facebook post Friday, Dukes wrote that the festival has "assisted the community through education outreach, free entertainment for all ages, food, fun, healthcare screenings and registrations." The Tribune asked officials at Huston-Tillotson for a year-by-year accounting of how much the Heritage Festival contributed to the school's scholarship fund. Linda Jackson, a spokeswoman for the private university, said Tuesday that information about scholarship donations is released only to donors and not to the public. Huston-Tillotson offers its campus at no charge to Heritage Festival event organizers, who must pay for janitorial and security contractors. The event has operated in partnership with three nonprofits over its history: the Pro Arts Collective, the Women in Jazz Assocation and, this year, the Austin Area Urban League, according to Parker. The 2013 tax filings for Women in Jazz note that event costs totaled more than $51,000 and that it operated at a loss of $3,812. Founder Pamela Hart told the Tribune the loss contributed to the group's decision not to sponsor it any longer. "We floated it for a couple of years," she said. When the losses were too much to bear, Hart said she asked Dukes for an administration fee to handle producing the festival and doing the bookkeeping. Hart said Dukes refused, leading Women in Jazz to pull out as a sponsor. "We used our internal organization to make her event possible," Hart said, adding that her group never handled the scholarship money that the festival raised for Huston-Tillotson. "Dawnna Dukes handled that herself," Hart said. "We never handled the scholarship." Vendors interested in setting up tables at the Heritage Festival are charged a base rate between $30 and $200, depending on the size and structure (corporate vs. nonprofit, for example) of their organizations. According to the website, those vendors are instructed to contact "The Office of State Rep. Dawnna Dukes with any questions." The fax number for Dukes' Capitol office is listed for vendors who want to register by fax. Those who complete the application are told to mail their checks and money orders to Dukes' state Post Office box — specifically, to "African American Community Heritage Festival c/o State Representative Dawnna Dukes." A photo on the Heritage Festival website shows a smiling Dukes presenting a mock check for $20,000 to be paid to Huston-Tillotson University. The oversized check also bears Dukes' signature as the payor. Parker and Dukes said the lawmaker never handled any money. "Not one check, not one piece of cash goes into my hands or my account,” Dukes said.